Kentucky doesn’t have a stellar reputation when it comes to animals. For one, it’s one of the Five Best States to Be an Animal Abuser. It’s also home to the Kentucky Derby, which, contrary to popular mythmaking, isn’t really that great for the horses involved. 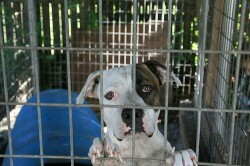 Then there are the state’s animal shelters. While Kentucky may be known for great bourbon, they are not known for having great animal shelters. Quite the contrary. Despite a 2004 law that requires county animal shelters to meet basic standards of care, many are still doing a subpar job. Take, for instance, the Clay County shelter. The situation at this institution is so bad that one county resident, Tori Smith, felt compelled to contact the Animal Legal Defense Fund and bring a lawsuit to force the shelter to improve conditions and begin complying with the 2004 law. According to the Kentucky Courier-Journal, the ALDF lawsuit alleges that sick and injured animals are not treated and “are often left to languish in their cages until they die or are eventually euthanized or adopted,” and that sick animals are not separated from healthy animals. The lawsuit also asserts that animals’ food is thrown onto the floor, “where it mingles with dirt, feces, urine and other waste,” and that animals don’t have access to clean water. “On at least one occasion, and possibly routinely, animals were left without food and water over the weekend,” according to the lawsuit. For the plaintiff in this case, Tori Smith, bringing this lawsuit is just one of the many ways she seeks to help animals. She is very active in the rescue, fostering, and adoption of animals from the Clay County animal shelter, and has spent hundreds of dollars on veterinary bills for animals rescued from the shelter. There is reason to hope the lawsuit will make a difference. Over the last couple of years, the ALDF has brought suit against two other Kentucky animal shelters, one in Estill County and the other in Robertson County. In both instances, the ALDF was able to reach agreements with the shelters to dramatically improve conditions for animals. Besides the ALDF lawsuit, something else that could help animals languishing in Kentucky shelters is to give the state’s 2004 “Humane Shelter Law” some teeth. Currently, each county is essentially self-regulating. If a county fails to live up to the standards set by the 2004 law, the state government really can’t do much, as the law lacks any real enforcement provisions. That’s why concerned citizens like Tori Smith have to take matters in their own hands and bring lawsuits such as the one in Clay County. And that’s why the state government of Kentucky needs to have the power to regulate animal shelters. Ask Governor Steve Beshear to step in and end the suffering of all innocent animals in Kentucky by pressing the legislature to act and have the state take back responsibility for overseeing animal shelters.